You’re young. You’re wild. You’re free. So now what? As a teenager or young twenty-something, the world is your playground, your canvas and your creation. It’s a time for you to conquer and work hard, but reap the benefits as well. Crossing off items on this bucket list will take you from zero to sixty in terms of self-confidence and self-improvement. They’ll help you get your foot in the door in no time. There are so many things to experience and so little time to organize and plan. But embrace the spontaneity and have no fear, a bucket list is here! The power of giving is completely unexplainable -- for both parties. It’s a feeling you can only get when you participate first hand and feel passionate about the cause. Branch out on campus and find out about local or campus-based philanthropies. If you’re a graduate, reach out to your friends at work or family and ask them about a cause they’re passionate about. As great as it is to jump on Pinterest and whip up a meal, there’s something about having your own recipe that you can stick to when all else fails. Maybe work on learning a recipe that’s been in the family for years, or experiment on your own until something clicks! Whether you’re at a big school or a small school, connecting with a professor can seem daunting. There are so many students and a lot of times you just feel like a secretary, scribbling down notes as quickly as possible. When you form a connection with a professor, the class experience and environment can completely change. Take the road less travelled. Visit places on campus that you’ve always wondered about or heard about. Whether it’s a cliché place on campus that holds traditions or a small spot on campus that you’ve walked by and thought about, pay a visit to the spot. It may be your new go-to place. Then, write about it. If you’re interested in pursuing a career in writing, these adventures will help you get new clips! You put two days, six cups of coffee and an all nighter into it. You deserve it. Enough said. Learning about other countries and other cultures really expands your horizon. Plus, how cool would it be to learn a new language and try new food ... for free? It’s cheesy, cliché and can be found in any new student orientation pamphlet. There’s a reason why! Participating in a campus tradition will really make you appreciate your school and feel connected, so go all out, grab a group of friends and attend! You could be a top-tier chess goddess and not even know it. Well, maybe not, but you can’t knock it ‘til you try it! Try something new ... you may find your new forte. Some call it self-actualization. Some call it power. I call it courage. Some people feel that they are a naturally born leader, and others have no idea. Either way, try it out. It will bring you a large dosage of self-confidence to know that others consider you to be a leader. Not only is this a great way to get involved, but it’s a great way to find what you’re interested in as well. Turn your passion into an action and form a club on campus! Pass out fliers and find a teacher to sponsor you. You’ll be surprised at the responses you’ll get, and you may even start a trend on your campus! This can be as fun or as miserable as the situation makes it. If you’re cramming for a test, it probably won’t be such an enjoyable experience, but hey, that’s what being a college student is all about. If you’re doing it for fun, load up on snacks, laugh as much as you can and enjoy. I guess this can go along with finding a recipe of your own! Whip out the ingredients, cook up something fun and enjoy your friends’ company and creations. After a long day of work, you’ll be glad you have these recipes (or the leftovers!) to come home to. Getting cultured can be fun and educational! Get a group of friends together and plan an around-the-world party. If you’re doing it at a house, make each room a different country! Go around the room sharing facts about the country and culture. If any of your friends have studied abroad or travelled there, have them tell their stories. Plan the event so that each room has different food and drinks. You’re in for a fun night and educational night when you’re “travelling” with your friends by your side! Don’t be afraid to be gutsy and reach out to someone who has more authority than you! You never know how much you’d be able to learn from them unless you take a chance. Paint your face, order a hot dog and cheer until your voice is gone! There’s something special about cheering on the school you worked hard to get into! Airtan Airways offers a program for 18- to 22-year-olds that allows you to fly standby to select cities for a very low price. Go with a friend (or a few) and spontaneously go somewhere for a weekend. Bring a backpack and airplane regulation-friendly toiletries. Don’t plan and enjoy! No matter how many of these you cross of your list, embrace your youth and create goals! Creating goals and embracing spontaneity will always create space for more happiness in your life. 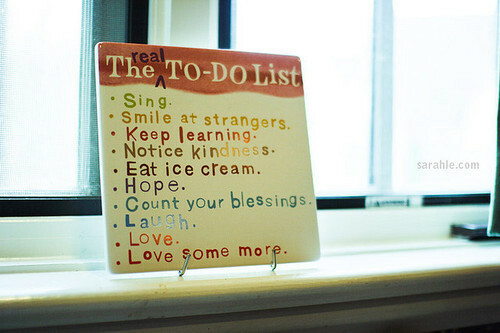 Perfect list. It's funny at the first blush but it's trully and right.